Follow their adventure on the Red Deer Riverwith its Badlands and Dinosaurs, which they paddled in August last year, 350km from Dixon Dam to Empress! The Red Deer River is located in the Southern part of Alberta, Canada. The City of Calgary just touches it. The residential areas of northeast Calgary straddle the divide between the Red Deer and Bow Rivers. 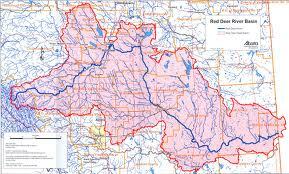 Three major communities, Sundre, Red Deer, and Drumheller are located on the Red Deer River. There are numerous small communities scattered on the farmland that is situated on both sides of the river. Over 100,000 people live within the basin of the river. Over 2,000,000 people live within 150 kilometres of the river.